A long-running Ebola blood study in the Democratic Republic of the Congo that sets up makeshift labs in remote parts of the country will join the vaccine trial underway. During an outbreak of the deadly Ebola virus like the one underway in the Democratic Republic of the Congo (DRC), research necessarily takes a back seat to proven containment strategies, including isolation of infected people, identification and testing of their contacts, and safe burial of the dead. But the DRC has approved one vaccine trial, and a second study piggy backed on it to assess immune response to the vaccine, in the hope that the “experimental” intervention might help curb the outbreak and offer some insights for the future. The unlicensed vaccine, made by Merck, performed exceptionally well in a large clinical trial held in Guinea during the 2015 outbreak, but it came as that epidemic already was winding down and had little impact on bringing it to an end. At last count in the DRC, 52 cases were confirmed, probable, or suspected; 22 deaths had been reported; and the outbreak had spread to three locations in Équateur province, including a city of 1.2 million people on the heavily trafficked Congo River. The second study will try to extract more data from the vaccine trial. Since 2015, a group led by epidemiologist Anne Rimoin from the University of California, Los Angeles, has been working with colleagues in the DRC on an Ebola study that has taken blood samples from more than 1000 health care workers, as well as about 100 survivors and their contacts. Now, in collaboration with Boum and the vaccine team, the group is expanding that work to collect samples from the new volunteers who are participating in the vaccine trial. “Usually during outbreaks you’re scrambling to get these protocols in place and luckily we already have one that matches up quite nicely with the objective of the government and everyone who is wondering how well these vaccines might work,” Rimoin says. The blood work could clarify whether people have pre-existing immunity to Ebola, in which case the vaccine would be boosting an existing response. Analyses of various immune responses triggered by the vaccine in people who do and don’t develop Ebola also could help clarify why the vaccine succeeds or fails. To properly collect and store blood samples, Rimoin’s team travels to remote areas of the DRC with freezers that go down to –80°C, which they power with their own generators and batteries. They also cart in thousands of test tubes, pipettes, and other equipment to create their field lab. “When we’re doing this work we spend a lot of time on logistics of how we keep samples cold,” Rimoin says. Although the Guinea trial found that the vaccine offered an astonishing 100% protection in vaccinated clusters, it did not take blood from participants. Rimoin points out that the Guinea population differs both genetically and immunologically from that of the DRC. In particular, she notes, Ebola had never been seen in Guinea before that epidemic, whereas this is the ninth outbreak in the DRC. “It’s very important to get as much data as you can to understand how the vaccine works in different populations,” Rimoin says. Some investigators who worked on the Guinea study question the practicality and value of taking blood samples in the DRC. “Blood draws would complicate significantly field operations in communities affected by the disease, where blood is not just a fluid but is charged with symbolism,” says Marie-Paule Kieny, who helped run the study when she worked for the World Health Organization. She is now director of research at INSERM, the French biomedical research agency, in Paris. At the time of the Guinea study, communities reacted violently to some outreach workers, and there initially was much concern that many people would not even volunteer to participate in a vaccine study—but nearly 8000 people did. Mark Feinberg, who heads the International AIDS Vaccine Initiative in New York City and who worked for Merck during the trial in Guinea, also questions the value of Rimoin’s study. Merck’s vaccine was tested in many other studies, and several of those did blood draws to help clarify the relationship between the vaccination and various immune responses. Merck says it plans to use data from some 18,000 vaccinated people in those trials to support its application for licensure next year. 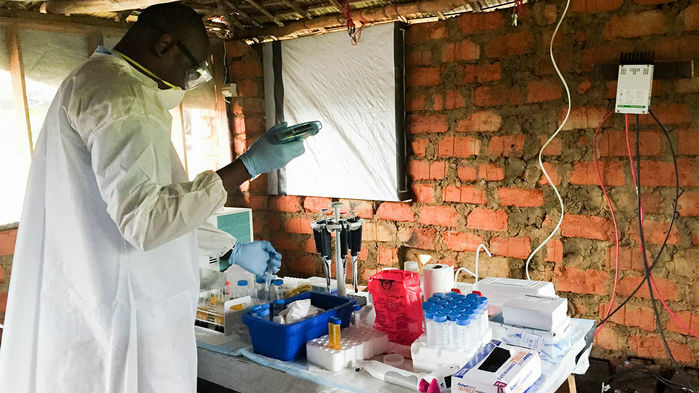 “I am not sure that having additional data on immune responses in the current outbreak in DRC would add significantly to this data package,” Feinberg says. Rimoin expects that their studies will uncover surprises. Indeed, in the 30 January issue of The Journal of Infectious Diseases , Rimoin and colleagues describe how they found Ebola antibodies in hundreds of people in the DRC who live in areas that have never had a documented outbreak of the disease. “There are more questions to answer than just licensure,” she says.